How Bright Are Colored LEDs? Measuring and describing the brightness of colored LEDs is an increasingly important part of a lighting designer’s practice. They are used more often, and in more types of projects, than ever before. Yet, we don’t have an accurate method for understanding exactly how much light is being produced and how bright it will appear. It’s a problem that the lighting industry needs to solve, and soon. The human eye does not respond to all wavelengths of light equally. We have the greatest response to the yellow-green light of 555 nm. Our response falls off considerably in both directions. That is, wavelengths of light do not contribute equally to our perception of brightness. The sensitivity curve of the human eye is called V(λ) (pronounced vee lambda) and is shown below. The definition of a lumen, the measurement of brightness of a light source, is weighted using V(λ) and essentially assumes that the light source emits light across the visible spectrum – in other words, it produces a version of white light. Light meters are calibrated to measure white light using V(λ) so that their measurement of brightness corresponds with our perception. 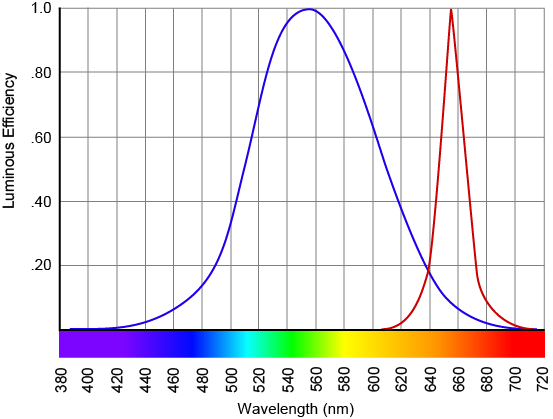 Individual colored LEDs emit only a fraction of the visible spectrum, as shown below in the graph of V(λ) and the SPD of a red LED, and that’s the problem. Light meters measure the light that the colored LEDs provide, of course, and this information is included on an LED fixture manufacturer’s cut sheets, but it often makes no sense. For example, an RGBW fixture I’ve arbitrarily selected reports the following output in lumens: Red 388, Green 1,039, Blue 85, White 1,498. Since brightness is additive, the output when all LEDs are at full should be 3,010 lumens. However the Full RGBW output is given as 2,805 lumens! That’s 7% lower than what we expect. The essential problem is that the colored LEDs give the light meter only a fraction of the spectrum it’s designed to measure. The meter provides a result based on its programming and calibration, but the results are often nonsensical or at odds with our perception. This problem doesn’t affect only architectural lighting designers. Film and TV directors of photography and lighting directors also rely on a light meter’s accurate measurement of brightness in their work, and when using colored LED fixtures the light meter is likely to be wrong. 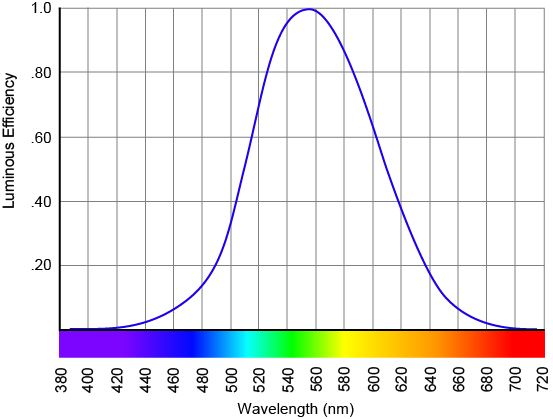 In fact, even white light LEDs can be difficult to measure accurately because of the blue spike in their SPD. For now, the only way to accurately assess the brightness of colored LEDs is to see them in use. Lighting professionals need to let manufacturers and others know that the current situation is not acceptable, and that an accurate method of measuring and reporting the brightness of colored LEDs is a high priority. Talk to fixture and lamp sales reps, fixture and lamp manufacturers, and decision makers at IES, CIE, NIST and other research and standards setting organizations. There’s a solution out there. We need to urge those with the skills and resources to find it to get going! Comments Off on How Bright Are Colored LEDs?